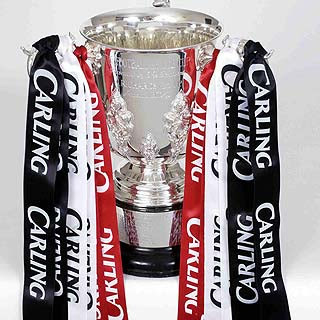 Dule's Betting: Carling Cup 10-11.08. Here’s some interesting infos about games tonight. It could help if you already have some opinion. Otherwise, could be confusing. Enjoy. Plymouth have gone out in the first round in 15 of the last 17 years, including the last two. Aldershot have lost their last four first-round ties in this competition. Barnsley have not won a competitive home game since 16 March (v Nottingham Forest). Rochdale have only qualified for the second round once in their last eight attempts. They have lost last five away matches, scoring just one goal. Bradford have lost at this stage in each of the last four years. They are chasing a fourth successive home win. Forest are unbeaten in seven matches against the Bradford (W5, D2). Since returning to the Football League, Carlisle have only been knocked out of the League Cup in the first round once (against Burnley in 2005). Huddersfield have lost their last three League Cup ties away from home. Chesterfield have only won one of their last seven first-round ties in this tournament. Boro have won only one of their last nine away games. Derby have lost their opening League Cup game in five of the last seven seasons. Since returning to the Football League in 2003, Doncaster have only failed to progress beyond the first round once (losing to Notts County in 2008). Accrington have never won a League Cup tie away from home. This is Accrington's fifth season in the League Cup. They are aiming to reach the second round for the third time. Nottingham Forest (2006) and Walsall (2009) are the only clubs Stanley have knocked out of the competition in their history. It is five months since the MK Dons last recorded a home victory: 3-1 against Swindon in League One on 9 March. Rotherham have fallen at the first-round hurdle only once in nine years. They knocked out Sheffield Wednesday, Wolves and Southampton in reaching the fourth round in the season before last, and Derby in the first round last season. Charlton have not won or scored in this competition for three years. Southampton have only ever been eliminated in the first round of the competition twice (1961 and 2007). Bournemouth have lost in the first round four seasons in a row. Stockport have been knocked out in the first round of the League Cup in five of the last six years. Wycombe have not managed to win a single match in the League Cup since their club record run in 2006/07 when they made the last four. The Chairboys have lost three of their last four League Cup matches by 4-0 margins, including the last two.